one hot Friday in July. when Clara’s car caught it. In a moment of self-absorption, Clara Purdy’s life takes a sharp left turn when she crashes into a beat-up car carrying an itinerant family of six. The Gage family had been travelling to a new life in Fort McMurray, but bruises on the mother, Lorraine, prove to be late-stage cancer rather than remnants of the accident. Recognizing their need as her responsibility, Clara tries to do the right thing and moves the children, husband, and horrible grandmother into her own house—then has to cope with the consequences of practical goodness. As Lorraine walks the borders of death, Clara expands into life, finding purpose, energy, and unexpected love amidst the hard, unaccustomed work of sharing her days. But the burden is not Clara’s alone: Lorraine’s children must cope with divided loyalties and Lorraine must live with her growing, unpayable debt to Clara–and the feeling that Clara has taken her place. 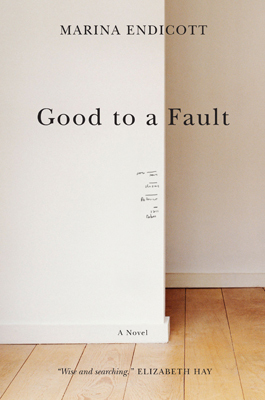 Good to a Fault won the 2009 Commonwealth Writers Prize for Best Book, Canada/Caribbean region. It was short-listed for the 2008 Giller Prize, longlisted for the Dublin IMPAC Prize, and was featured on CBC Radio’s Canada Reads in 2010. Here’s an out-take from Good to a Fault, featuring the irascible Mrs. Pell and a snake. And a favourite review of Good to a Fault, from the versatile blogger Stephany Aulenback at Crooked House. Copyright © 2019 MARINA ENDICOTT. Book Landing Page By Rara Theme. Powered by WordPress.